With no consultation, the Wynne government has introduced Bill 41, titled the Patients First Act, which will significantly impact the relationship between patients and their doctors. Bill 41 will allow the government to waste more on the expansion of bureaucracy instead of investing in frontline care. 1. Access to my doctor will be decided by government employees. 2. My confidential patient health records can be accessed by bureaucrats. 3. Funding will be taken away from hospitals and the frontline care provided by doctors and nurses to instead hire more government bureaucrats. 4. Provincial medical standards will be decided by bureaucrats and politicians instead of by medical experts. 5. The government will have control over all aspects of my healthcare with more emphasis on saving money instead of saving lives. I am deeply concerned about the increasing Ontario government interference in my healthcare and I want Bill 41 to be stopped. In May, Wynne passed the Health Information Protection Act giving Ministry of Health employees unregulated access to my confidential patient health records. This continued invasion of my privacy is unacceptable. 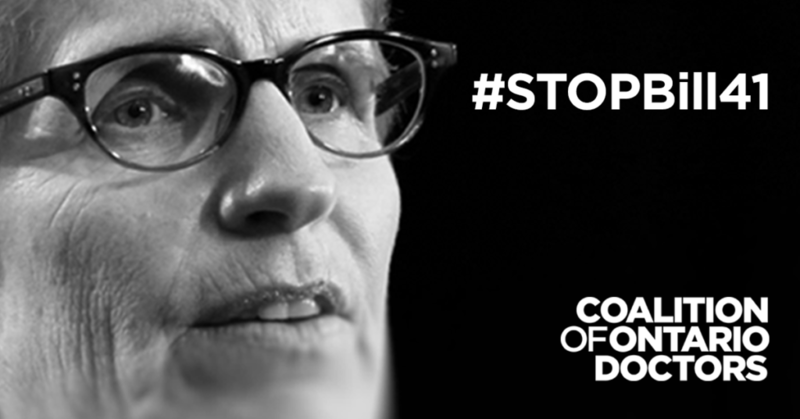 It’s time for Wynne to stop putting bureaucrats ahead of patients. As my representative, I demand that you take immediate action to stop Bill 41. #STOPBill41.